ASUM continued its ongoing representation of the ultrasound community at the Health Budget in Canberra, Australia, on Tuesday. 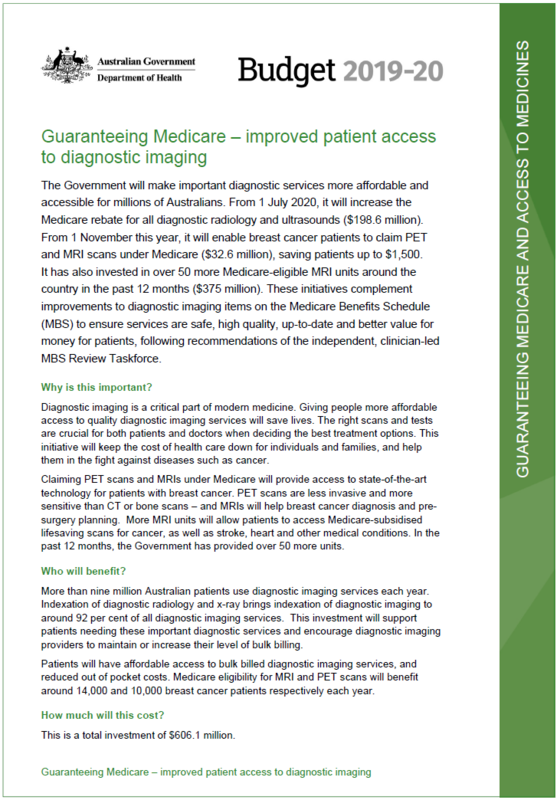 After many years of advocacy some of the concerns of many of our members and their patients have been recognised with the budget addressing long-term issues around Medicare indexation and access and affordability to a range of imaging services. We welcome the new funding commitments which will end a 20-year freeze on the Medicare rebate for ultrasound and x-rays and investment in new imaging and treatment services – particularly for breast cancer patients. The Australasian Society for Ultrasound in Medicine (ASUM) has today welcomed the commitment of indexation following the Health Budget announcements. Access and affordability have long been a concern for our patients, with ultrasound examinations routinely used for initial disease diagnosis, as well as ongoing management. The Australian public pays significant out-of-pocket healthcare costs for ultrasound services. Indexation for ultrasound and all imaging services have been frozen for more than 20 years. The government have committed to invest $198.6 million to increase the Medicare rebate for ultrasound and x-ray services. This will likely equate to a 1.5 to 2% increase to each Medicare item for ultrasound. ASUM President A/Prof Fred Joshua said the funding announcements were timely. ”Patients should not miss vital examinations to assist with a diagnosis or management of a health condition due to out of pocket costs and reduced access to care,” A/Prof Joshua said. Women’s health has also benefited. Ultrasound is often the first line of examination for pregnancy and gynaecological investigation and a number of improvements have been introduced in the budget for women undergoing treatment for breast cancer. The Budget highlighted the commitment to guaranteeing Medicare and improving access to medicines; supporting our hospitals; prioritising mental health, preventive health and sport; investing in health and medical research and continuing to progress aged care reform, focusing on improving access and quality of care. These priorities are outlined in the Portfolio Budget Statement. In addition, significant investments have been made in mental health, key hospital services, prevention and management of chronic disease and other lifestyle-related diseases, and research through the new 10-year investment plan for the Medical Research Future Fund. 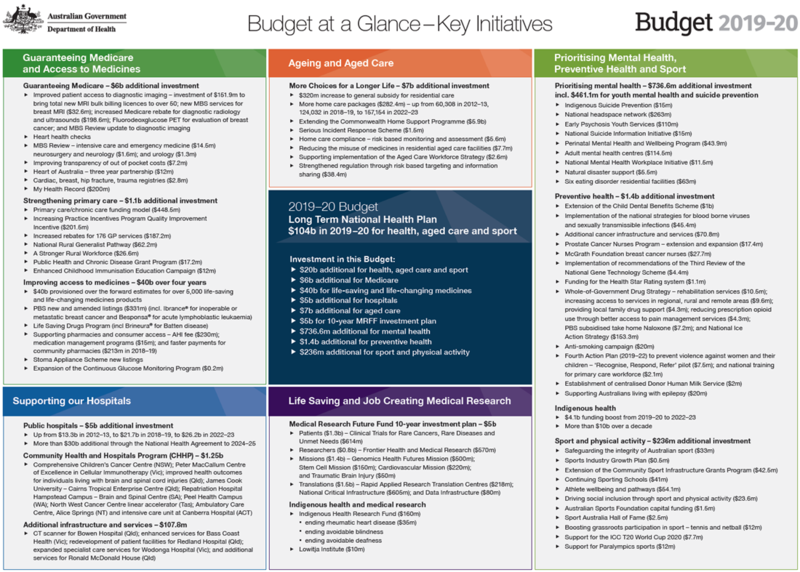 The Budget sees an increase of $20 billion over the forward estimates for the Health portfolio, from $102 billion in 2018–19 to $115 billion in 2022–23. The government will strengthen primary health care with a $1.1 billion commitment. Funding for practitioners to support more flexible care models and health outcomes. A stronger rural health strategy to train and attract generalist to rural regions of Australia. Five National Strategic action plans to be implemented including kidney disease and heart disease and stroke. The National Rural Generalist Pathway will ensure rural generalists providing a broad skill base to the community are appropriately trained, remunerated and resourced. Many of the recommendations from the MBS taskforce review on ultrasound services have been considered as part of this budget review. ASUM actively engaged in the consultation process to support changes for all providers and patient care. Members should be aware of a national strategy funded by the government to provide transparency for excessive out of pocket costs charged by medical specialists. Patient fees charged will be made publicly available on a new website particularly for those items funded under Medicare. This will allow the public to better understand potential costs of treatment particularly where more than one service is required such as breast cancer. Specialist fees focused on cancer, gynaecology and obstetrics service will be the initial focus of higher use areas and therefore greater out of pocket costs. This is designed to inform patients and GP’s in the decision on referrals and reduce ‘bill shock’. Investment in vital services and drugs for patients undergoing various cancer treatments. Additional infrastructure investment to support rural and regional cancer services and specialist nursing care. A 10-year plan will give researchers and industry certainty and direction for medical research. Development of a dedicated office to support rapidly increasing investment. Key areas such as Aboriginal and Torres Strait islanders, and fighting diabetes are key areas of research. The links below will direct you to the Government Health website for further detail to each commitment. If you would like to unsubscribe from all ASUM communication, click here to login to myASUM and change your preferences, or email membership@asum.com.au. To unsubscribe from ASUM News only, click the Unsubscribe link below.